The global energy transition with renewables is well underway, with record new additions of installed renewable energy capacity, rapidly falling costs and the decoupling of economic growth and energy-related carbon dioxide emissions. In 2016 alone, the global installed capacity of renewables increased by 161 gigawatts. The Latin America and the Caribbean (LAC) region continues to have some of the world’s highest shares of renewable energy deployment. By the end of 2016, Bolivia led the world with the highest investment in renewables per GDP; Honduras was fourth. 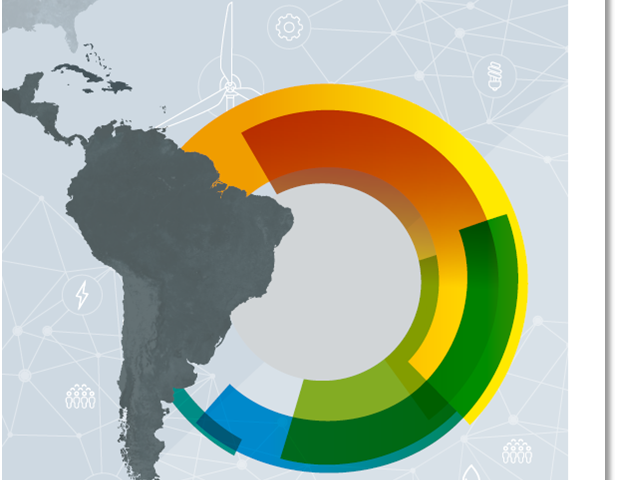 Argentina, Brazil, Ecuador, and Mexico each ranked as one of the top five countries either on investment in, or total installed capacity for, a specific renewable energy technology. Falling technology prices, along with innovative and more sustainable ways of meeting energy needs are accelerating this uptake. Diversification within the renewable energy sector is growing globally as is policy innovation. Diversification underscores the importance of a systems approach to energy, where the generation and use of renewable energy is looked at from a cross-cutting perspective. This includes social participation, in the form of universal energy access, socio-economic co-benefits and empowerment of marginalised social groups and local communities, supporting infrastructure such as transmission and distribution networks, balancing supply and demand measures, including through efficiency measures, and sector coupling as well as a wide range of enabling technologies. Renewable energy policy support is evolving as well, with tenders being the most rapidly expanding form. The design of renewable energy tenders is becoming increasingly sophisticated. REN21’s Renewables 2017 Global Status Report documents that renewable energy tenders were held in 34 countries in 2016 – more than double the year before. Tenders have been a particularly popular mechanism in the LAC region, attracting record-setting participation. In some cases, tenders now consider parameters such as local job creation and local economic development, better integration of variable generation into the grid, greater geographic distribution, and promoting a diversity of actors involved, such as communities. Yet despite existing research on the optimal design of tender schemes, little is known about how best to combine tenders with community involvement and empowerment. Many parts of the LAC region that have important renewable energy resources are inhabited by indigenous peoples that possess a strong collective identity and a deep cultural relationship to their land and territory. The inherent distributed nature of renewable energy, together with the modularity of renewable technologies, favourable regulations, and the development of innovative financial mechanisms, collectively support the development of new roles for citizens in renewable energy developments, such as tenders. However, an unintended outcomes of renewable energy tenders have been the de facto exclusion of a range of actors – including small business, communities, indigenous people, local governments, property developers and farmers – as well as the concentration of projects in areas that have the most competitive renewable energy resources, increasing pressures on communities living in these locations. To maximise the benefits from community-driven renewable energy projects in the LAC region, there is a need to know how best to combine tenders with community involvement and empowerment. One such way could be with an accession mechanism that captures both the efficiency of tenders and the effectiveness of feed-in tariff for community projects. During a renewable energy tender, a portion of the capacity or the energy could be reserved for community-driven renewable energy projects. After the tender is finalised, community-driven renewable energy projects can access the reserved un-tendered capacity/energy at the price based on the result of the tender. Communities apply for a PPA during a fixed time window (e.g., three years) on a first-come-first-served basis until the reserved capacity/energy is allocated or the time window expires. The permanent open call and the known tariff features of the accession reduces uncertainty for community-driven renewable energy projects, allowing sufficient time for project preparation and access to finance. Discussion about how the tendering process, coupled with the concept of community-driven renewable energy projects, can offer a great unrealised opportunity both in the LAC region as well as globally are ongoing. A policy framework that promotes community-led projects can offer a constructive solution to potential conflicts with these communities. Socio-economic benefits are gaining prominence as a key driver for renewable energy deployment policies. Policy makers see the potential for job creation, increased income and contribution to industrial development. Due to the re-investment of benefits in the local economy, community-driven renewable energy projects have been shown to generate about tenfold additional employment and income impact compared with non-community driven projects. Typically, most of the projects’ direct benefits are distributed locally. Achieving a global energy transition requires that we rethink current models and approaches. Innovative and more sustainable ways of meeting our energy needs –placing energy consumers at the center– are the key to accelerating the shift away from a world run on fossil fuels.